Ongwae, Kimemia urge government to embrace wind and solar energy investments to reduce cost of power – Kenyatta University TV (KUTV). All Rights Reserved. Kisii governor James Ongwae and his Nyandarua counterpart Francis Kimemia on Thursday appealed to the national government to embrace investments in green energy in Kenya in order to reduce cost of electricity in the country. Mr Ongwae called on the national government to create incentives to allow more companies to invest in power generation in order to enable creation of adequate electricity to meet the country’s demands and also reduce the cost of power. The two who are in Israel to attend a major international energy convention dubbed the Eilat-Eilot International Energy Conference said Kenya should emulate Israel by embracing solar and wind power energy as an alternative source of power. “We are happy with the kind of technology we are seeing here and the production of clean energy for domestic and industrial utilisation.We urge the ministry of energy to allow more production of clean energy and more investment in this kind of power generation in order to meet the increasing electricity demands in Kenya,”the Kisii governor said in Eilat. He said that over reliance in hydro- power which he opined is facing many challenges is not sustainable. The governor said that investment in alternative sources of natural energy would be good for the environment and creation of increased power connectivity. “In Kisii an investment in solar power and wind power generation can help us eliminate industrial use of wood fuel especially by tea factories still relying on wood as a source of energy and as a way of cutting costs,” he said. Mr Kimemia on his part said that attractive mechanisms that can make it possible for great green energy innovations like solar power to penetrate Kenya should be accepted. “We need to create incentives and easen access for the Israeli companies and others interested in alternative power generation to access our markets,”Mr Kimemia said. The governor who was speaking during a panel discussion on technology and innovation said that rigid bureaucracies was hindering growth and development in alternative energy despite the obvious needs and challenges faced by overreliance on hydropower which has faced challenges caused by climatic changes and global warming. “We still have power outages yet our county has great potential in solar power generation as well as wind power production.We must find a way of making it easy for our citizens to access cheap and clean energy. Several Israeli energy companies have expressed interest in investing in Kenya in order to help address the electricity deficits and help deal with the non reliable power supply. “We are ready to take up ventures in Africa and particularly in Kenya.We have studied the Kenyan situation and given the Israeli experience with solar and wind power this is the way to go for Kenya,”said Mr Yosef Abramowitt the UN Global green energy and ambassador who is also the President of Gigawatt Global. He said his company is already taking up projects in Kenya with two 10 MW projects each in Narok and Kwale. Negev Multi Agency Consulting Deputy Executive Director Wycliffe Omondi who is also accompanying the Kenyan delegation in the trip said that his organisation is working to ensure enhanced relationship and investments by Israeli established firms and start-ups in Kenya. 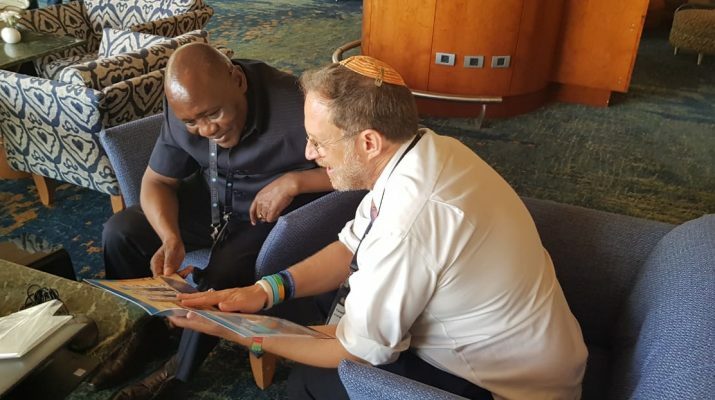 “We can generate greater investment opportunities for both Kenya and Israeli organizations in both countries.We want to use our intertrade links to connect more Israeli companies with Kenya,”he noted..
Mr Omondi said Negev Multi Agency Consulting is working with the Israeli embassy in Kenya to organise a major exhibition for Israeli companies in Nairobi n May next year.